“I vehemently deny today’s allegations made by Chris Kluwe. I want to be clear that I do not tolerate discrimination of any type and am respectful of all individuals. I personally have gay family members who I love and support just as I do any family member. The primary reason I entered coaching was to affect people in a positive way. As a coach, I have always created an accepting environment for my players, including Chris, and have looked to support them both on and off the field. The comments today have not only attacked my character and insulted my professionalism, but they have also impacted my family. While my career focus is to be a great professional football coach, my number one priority has always been to be a protective husband and father to my wife and children. 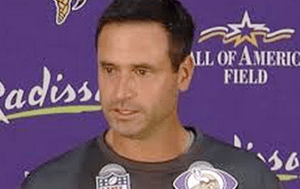 I will continue to work hard for the Minnesota Vikings, the Wilf family and all of our loyal fans.” – Vikings special teams coach Mike Preifer, in a statement published by NBC Sports. In other news it its been discovered that Mike Preifer’s “gay family member” is also Sarah Palin’s “gay best friend”. Harvey Preifer is reported to be 6 feet tall and a rabbit. Video – Kevin Smiths Upcoming Film “Red State” Gets A REDBAND TRAILER – Watch It Here!